If It's Too Loud...: The Rock'n'Roll HiFives - "Hold On"
I fully expected to hate The Rock'n'Roll HiFives. In fact, I wanted to. Their lead singer, Eilee Centeno, is sixteen. Her thirteen year old brother plays drums. The rest of the band? Their parents. 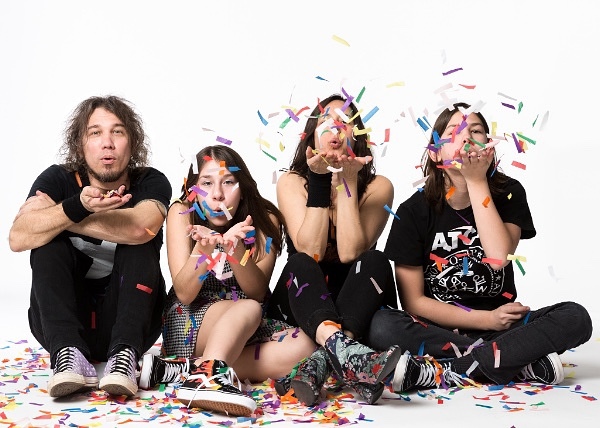 Guitarist/dad Joe Centeno played in bands before he became a dad, and the whole thing sounded like it would be this cutesy family band fueled by the dad's nostalgia. But... their new single "Hold On" is actually pretty great. It's not revolutionary by any stretch, but it's good, solid guitar driven power pop. Eilee's vocals have this great attitude to them, most likely because she's actually a teenager and isn't just trying to tap into teen angst. "Hold On" isn't for you if you want something avant garde or groundbreaking. But if you just want some fun throwback rock in the realm of Cheap Trick and The Runaways, you'll find it here. You can listen to "Hold On" below. The new album from The Rock'n'Roll HiFives, Re-Introducing The RocknRoll HiFives, will be out June 29 on Little Dickman Records. It can be pre-ordered here. For more on the band, check out their Facebook. Current summer vacation tour dates are below the song.